A NYPD vehicle in the Bronx on Thursday, March 3, 2016. The corner of East 161st Street and Courtland Avenue in New York City’s South Bronx, where the Bronx Defenders office is located, could be a street corner on Chicago’s South or West side. The legal advocates’ office sits in a commercial strip dotted with dollar stores and fast food joints. Inside, most of the people in the crowded lobby are black and brown. They are here to meet with defense attorneys. The office, in the 44th Precinct, generates more civil claims against police officers for injuring civilians than any precinct in the city. 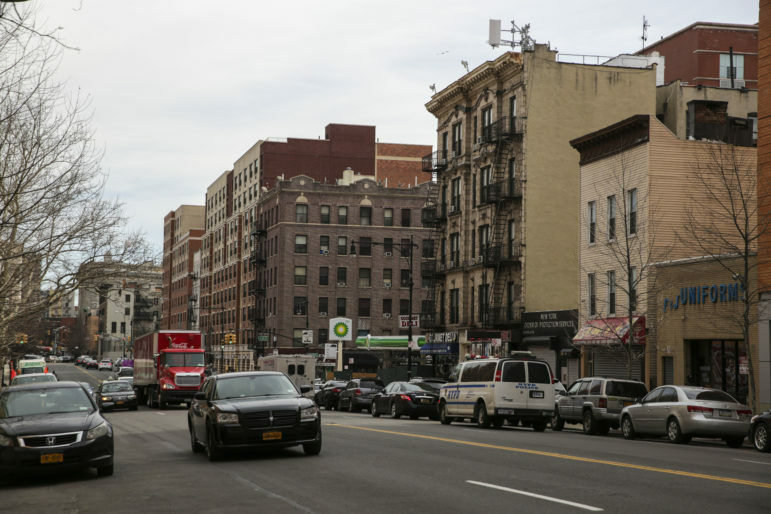 This stretch of the South Bronx is an unofficial testing ground for a two-year-old city program called ClaimStat that uses data to track allegations of police misconduct on a neighborhood level and shares the information with the public. ClaimStat seeks to prevent lawsuits against the city by scrutinizing details in thousands of claims filed against the city each year – from an unpruned tree shattering a car window to a botched procedure by a doctor at a public clinic to a police officer profiling a Latino teenager. At a time when police practices are under the public microscope, the analysis of claims against law enforcement officers potentially has a powerful impact on policing: If a city can flag practices that could result in lawsuits against the police department, it might be able to reduce the number of these legal actions. And the hundreds of millions of dollars now used for settlements could be diverted to core city services like education or street cleanup. Though the New York program is still in its infancy, the approach gets high marks from law enforcement experts. It gives city budget officials, typically not associated with oversight of cops, a role in helping to improve police practices. “Every dollar that we save on a judgment or settlement is another dollar that we can use toward combating homelessness and educating our children,” said New York City Comptroller Scott Stringer, the architect and administrator of ClaimStat. Chicago, in the throes of a police scandal and a debt crisis, could learn a lot from the approach, experts say. The City of Chicago spent more than $210 million for police misconduct lawsuits from 2012 to 2015, according to a Chicago Reporter analysis. Yet it hasn’t developed an adequate way to learn from the cases. Budget officials write the checks but have no voice in how police practices affect the same city coffers they struggle to balance each year. ClaimStat debuted in July 2014, the week before New York City Police Officer Daniel Pantaleo put Eric Garner in a fatal chokehold after arresting him for alledgedly peddling loose cigarettes. Garner’s family sued and settled a lawsuit against the city for $5.9 million. In New York, before anybody can sue the city or receive a settlement, state law requires him first to submit a notice of claim. It includes basic information such as when, where and how the offense happened. The notices are filed with Stringer’s office, where staff members enter the information into a database for analysis. The data are posted on a website, and Stringer releases detailed reports annually, with updates every few months aimed at helping agencies figure out how to drive down costs. The comptroller’s office said it has been able to link cuts to the city’s tree-pruning budget to increases in tree-related claims and prove that a public hospital in Brooklyn has more medical malpractice claims than others in New York City. One of the most important uses of the claims, according to Stringer, is sharing precinct-level-data with the New York Police Department to bolster the agency’s new risk management bureau, formed last year to help identify patterns of misconduct and mitigate risks that result in lawsuits. But Stringer cannot force the department to incorporate the data into its early warning system, which targets individual police officers accused of misconduct. Claims data is more useful in finding trends in specific neighborhoods than it is in identifying the behavior of individual officers. Sometimes people don’t know the names of the police officers they are accusing of misconduct. The claims data have other limitations. A notice of claim only includes the accuser’s account of what happened, and it isn’t as comprehensive as a lawsuit. Race-based patterns are difficult to discern because claim forms don’t ask for the accuser’s race. In 2015 the number of claims from people injured after a police encounter declined nearly 13 percent from the previous year, according to ClaimStat. The comptroller’s office credited the “unprecedented collaboration” with the NYPD. But there are a number of reasons that claims can fluctuate year to year, and the comptroller’s office is waiting to see whether New York City sustains that progress. 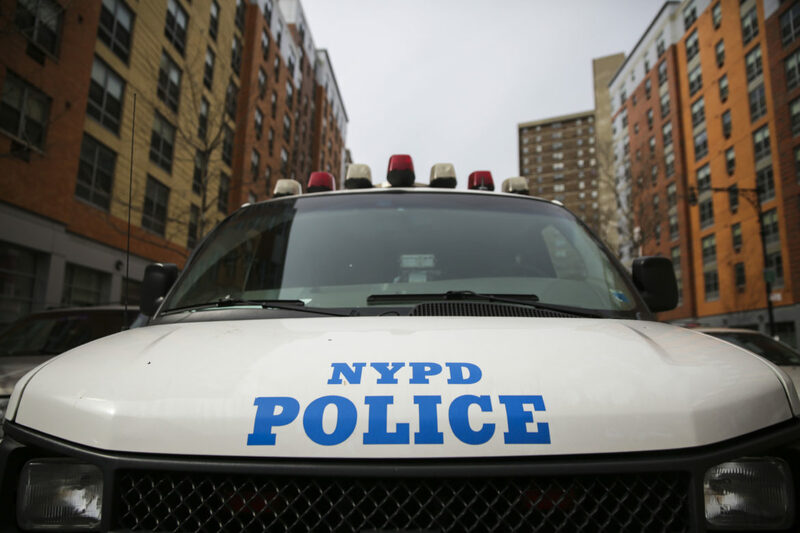 Claims data are highlighting longtime police practices in communities of color, said Kovel and Johanna Steinberg, general counsel for the Bronx Defenders. 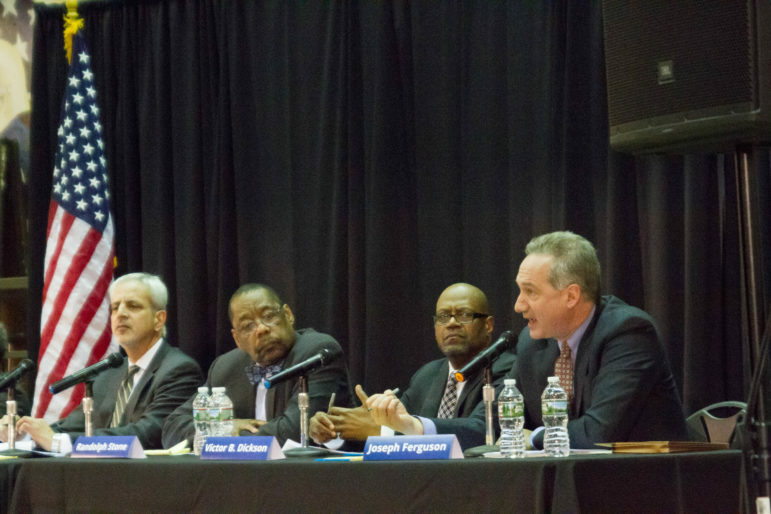 “There are cultures in each precinct, and some commanding officers – especially in the Bronx and other neighborhoods that are home to a lot of poor people of color – have a culture of heavier policing that inevitably leads to more claims,” Steinberg said. “It’s not like the Upper West Side” of Manhattan, where more well-to-do residents live. The death of an Eric Garner or Laquan McDonald, the teenager shot 16 times by a Chicago police officer, grabs headlines and exposes major problems with how police interact with civilians, Kovel said. But there are everyday encounters between police and the public that illuminate bad police practices – for example, a lot of notices of claim are for property damages that happen during warrantless police searches. 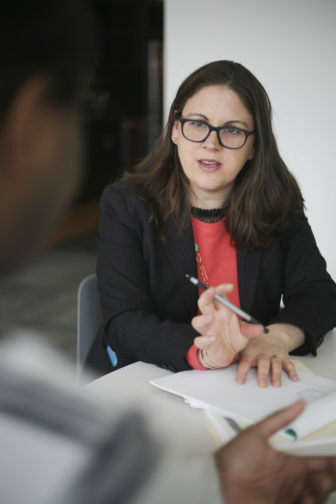 Molly Kovel, legal director of Civil Action Practice, speaks with a client at The Bronx Defenders office on Thursday, March 3, 2016. Robert Gangi has spent more than 40 years arguing for sweeping criminal justice and police reform in New York. Gangi, an activist and policy advocate, lives on the Upper West Side, a world away from the office of the Bronx Defenders. Enforcement of the stop-and-frisk policy has declined in New York City, he said, but “broken windows” policing hasn’t ended. NYPD officers still arrest people for things like walking between railway cars, putting their feet up on subway seats, jaywalking, selling loose cigarettes and drinking alcohol on their own stoops, said Gangi, adding that the overwhelming majority of those affected are black and Latino men. Council Member Jumaane Williams of Brooklyn, one of the most prominent voices for police reform on the New York City Council, is an advocate for a stronger early warning system to flag officers accused of wrongdoing. Williams is co-sponsoring a bill that would identify and discipline officers with a relatively high number of complaints, claims and lawsuits against them. He talks of creating a baseline, but he has no idea what the average number of complaints or lawsuits against a police officer should be. So far, the police department has deflected demands from Williams and other council members to share information from its early warning system. Like their counterparts in Chicago, police officers in New York operate behind a thick blue veil. New York state law prohibits the release of personnel files and disciplinary actions against police. In Chicago, the city’s agreement with the police union works in much the same way. NYPD brass says it is integrating ClaimStat data into the early warning system, but details haven’t been revealed, according to a report by the Office of the Inspector General for the NYPD. Williams said ClaimStat could be an important piece of the puzzle in identifying and addressing police practices. “Claims, lawsuits and all the complaints against officers should be looked at together,” he said. Chicago Inspector General Joseph Ferguson, right, addresses members of the community at a Police Accountability Task Force public forum in Pilsen on February 23. In Chicago, at a Police Accountability Task Force meeting earlier this year – part of Mayor Rahm Emanuel’s efforts to improve relations between the community and police – a woman asked why cops with “bad criminal behavior” are allowed to keep their jobs. Joseph Ferguson, the city’s inspector general, acknowledged the problem. Since October 2014, when he first heard about ClaimStat, Ferguson has been trying to get Chicago officials to adopt the approach. To get the most from lawsuit data, experts say the city should have an electronic database that lends itself to routine analysis. The Chicago Police Department doesn’t have one. CPD spokesman Frank Giancamilli said that right now, the review process consists of meetings between officials from the law department and police department when a misconduct case catches the city’s eye. Unlike New York City, Chicago doesn’t have a state law that funnels claims against the city through the comptroller’s office, essentially creating a depository for claims data. But Chicago still has all the data needed to launch its own version of ClaimStat. Claims can be filed several ways: The law department receives civil suits against the city and has the authority to enter into settlements of less than $100,000. The City Council finance committee handles settlements greater than $100,000. Small claims and property damage claims can be filed with the committee or the city clerk. Part of Ferguson’s job description is to improve the effectiveness and efficiency of city programs, so administering a version of ClaimStat would seem to align with his duties. However, while his office audits city operations, it doesn’t have the authority to analyze programs run by council committees, including the finance committee, chaired by powerful Ald. Edward Burke (14th). Burke supported a recent city ordinance that prevents Ferguson from reviewing the council’s settlement program and other finance committee operations. Burke did not respond to calls from the Reporter. Ferguson said the city needs an agency other than the CPD or law department to monitor claims and try to learn from them, especially as they relate to the police department. Since his office cannot, he wants the Department of Finance to take on the duty. Ferguson said the finance department agreed to launch a pilot claims analysis system last year. Ald. Leslie Hairston (5th), an attorney who sits on the finance committee, suggests that the city create an agency to review civil claims but would have to find a way to fund it. She agreed that Chicago could learn from the ClaimStat approach. This story is a collaboration with the Solutions Journalism Network. Alex V. Hernandez contributed to this report. Adeshina is a former reporter for The Chicago Reporter. Follow him on Twitter @ Public_Ade. The city paid more for police misconduct settlements last year than any year since at least 2011, bringing the total tab to well over half a billion dollars in just eight years. Despite spending more than $370 million on police misconduct lawsuits in six years, the city has not heeded official calls to analyze the cases for trends. Rather than rein in the practices that lead to police misconduct settlements, officials have borrowed millions to pay for these lawsuits, adding to the city’s crippling debt. Over time, the interest on the bonds will more than double the cost for police misconduct.